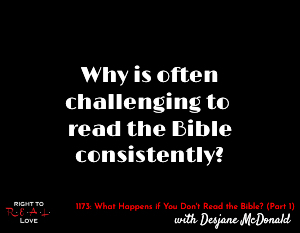 In this episode, Yahnathan is joined by Desjane McDonald to address the question: Why is often challenging to read the Bible consistently? Why is often challenging to read the Bible consistently? Why the enemy longs to keep you from reading the Bible. The importance of consistently reading the Bible. Desjane opens up about challenges she’s faced with reading the Bible.